MOFFETT FIELD, Calif. — Astronomers have rebooted their search for intelligent life on alien planets, and they've got thousands of targets to scan. After hibernating for more than seven months, a set of radio telescopes run by the SETI (Search for Extraterrestrial Intelligence) Institute has once again begun listening for signals from the many alien planet candidates discovered by NASA's Kepler space telescope, researchers announced Monday (Dec. 5). "This morning, at 6:18, we began re-observing the Kepler worlds," Jill Tarter, director of the Center for SETI Research at the SETI Institute, said Monday during the Kepler Science Conference here at NASA's Ames Research Center. "We're just extremely excited to be back on the air today." SETI researchers recently started using Kepler's discoveries to guide the ATA's activities. Kepler launched in March 2009 on a mission to hunt for Earth-size planets in their parent stars' habitable zone, that just-right range of distances where liquid water — and perhaps life as we know it — could exist. In January of this year, Tarter said, the SETI team started training the Allen array on the 54 planet candidates Kepler had detected in the habitable zone to date. The work didn't last long, however. SETI had to shut the ATA down in April after budget problems forced the Institute's former partner, the University of California, Berkeley, to withdraw from the project. 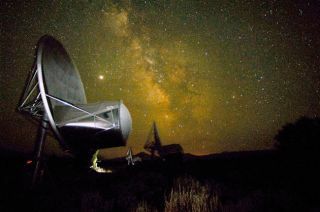 SETI launched a crowdfunding site, www.setistars.org, in an attempt to get the array back up and running. And the public came through, donating enough money to take the ATA out of mothballs. As of Monday, citizens had chipped in more than $230,000. Some funding help has also come from the United States Air Force, which is interested in using the array to track satellites and space debris, SETI officials said. On Monday, the Kepler team announced the discovery of 1,094 new exoplanet candidates, bringing to 2,326 the total number of potential alien worlds the instrument has detected in its first 16 months of operation. Researchers have confirmed only about 30 of these candidate planets to date, but Kepler scientists have estimated that at least 80 percent of them will end up being the real deal. The ATA will take special interest in Kepler's candidates in the habitable zone, Tarter said. But SETI researchers hope to scan every last one of the potential planets to minimize the chances that we're blinded by our assumptions about where life "should" be. "What we think we know actually might be a barrier to [finding] what is actually out there," Tarter said. "We intend to systematically explore all of these candidates." The search of the Kepler candidates will involve scanning 9 billion different channels in a broad window of microwave frequencies. It should take two to three years, at $1.2 million per year, to search for signals from every potential alien world from the study, Tarter said. It's exciting to focus the ATA on likely alien solar systems rather than just point the dishes toward stars and hope for the best, she added. "We now know where to look for planets," Tarter said. "We're going to take the public's quest for technosignatures to the next level."